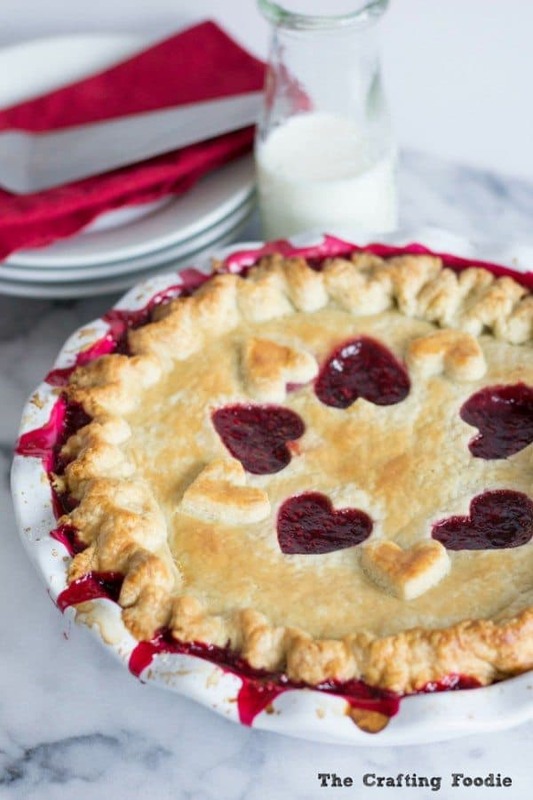 This festive and fun Valentine’s Day Red Ombre Cake is made with a flavorful, moist red velvet cake and it’s slathered with the fluffiest vanilla frosting and topped with heart shaped sugar cookies. 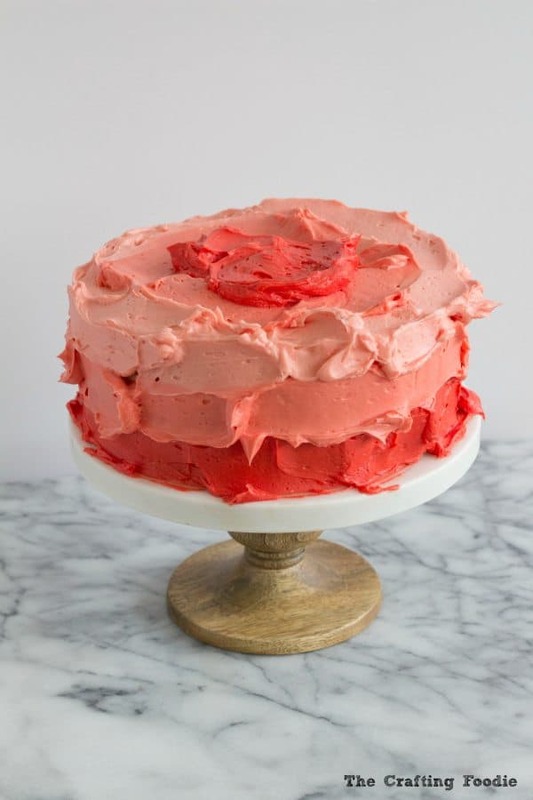 Nothing says Valentine’s Day more than this Red Ombre Cake! 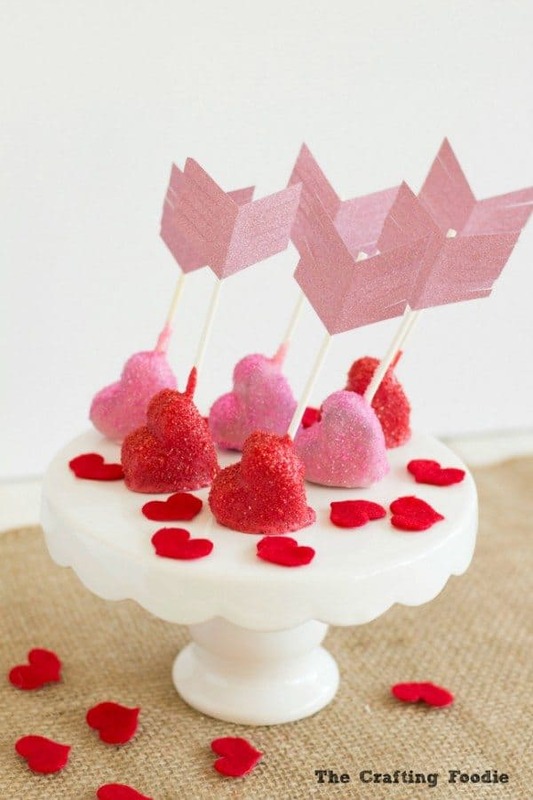 We love it because there are so many easy, delicious treats to make for Valentine’s Day. 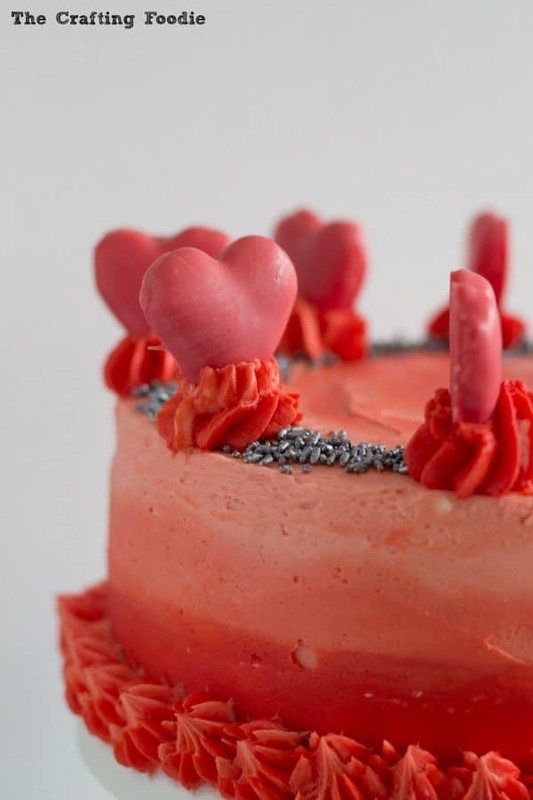 Last year we made this Valentine’s Day Red and Pink Velvet Cake. Which tasted amazing and looked pretty darn special too. 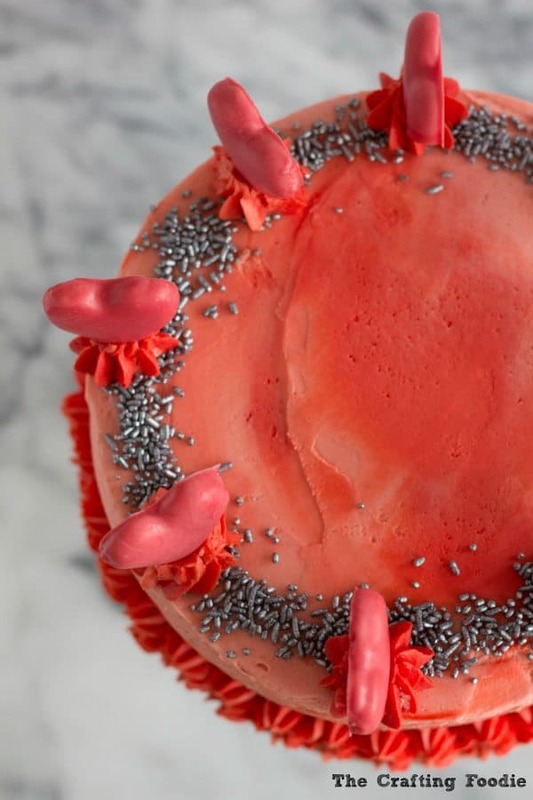 For this year’s cake I decided on this Valentine’s Day Red Ombre Cake. For the inside of the cake, I couldn’t stray to far from our beloved red velvet. It’s one of the only flavors that everyone in our family loves. I always want chocolate. My girls always want vanilla. My husband is the best because he loves both (I’m such a lucky girl :). So that leaves us with red velvet. My version of red velvet has just enough cocoa in it to give it a depth of flavor without overpowering the cake. It’s a little chocolate and vanilla – perfect for my family. 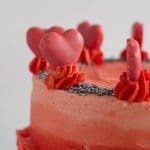 The ombre part of the Valentine’s Day Red Ombre Cake is so easy, and it gives the cake a unique look. To accomplish an ombre effect, all you need to do is divide your frosting into 3 separate bowls. Using food color simply tint the frosting 3 different shades of a single color. (I prefer using gel food color because it doesn’t water down the frosting.) Then slather the frosting on in 3 distinct section. Finally, take a clean offset spatula and smooth out the cake. It’s that easy! 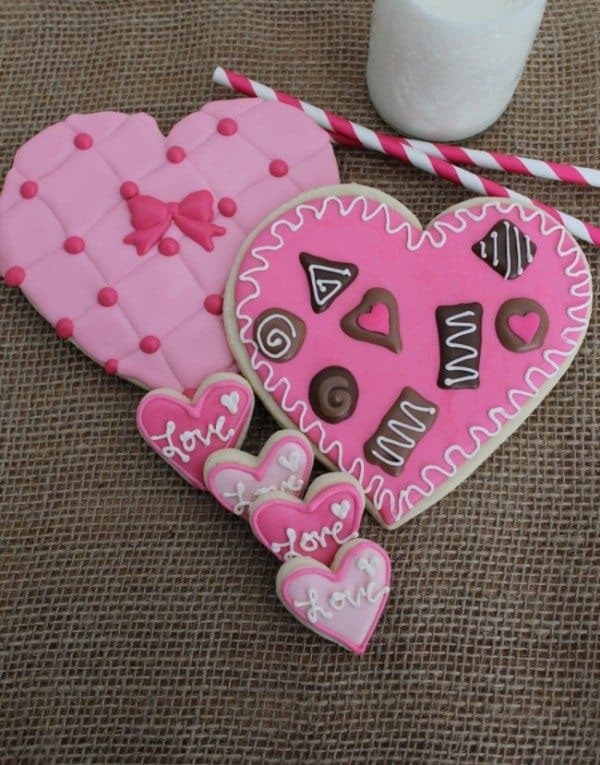 To give the Valentine’s Day Red Ombre Cake a little more texture, I topped it with mini-heart shaped sugar cookies. Since I didn’t want to whip up a separate batch of royal icing just for a few cookies, I simply dunked the cookies in some confectionery melts. 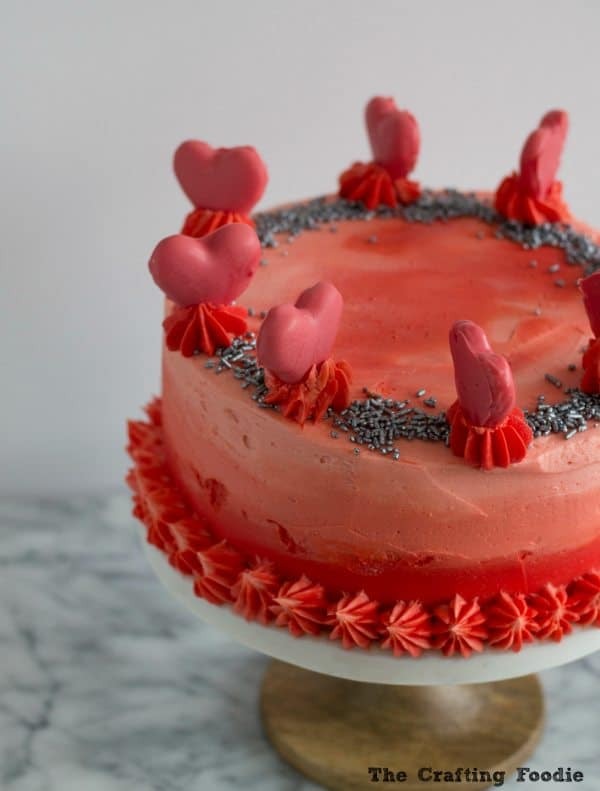 This festive and fun Valentine's Day Red Ombre Cake is made with a flavorful, moist red velvet cake and it's slathered with the fluffiest vanilla frosting and topped with heart shaped sugar cookies. 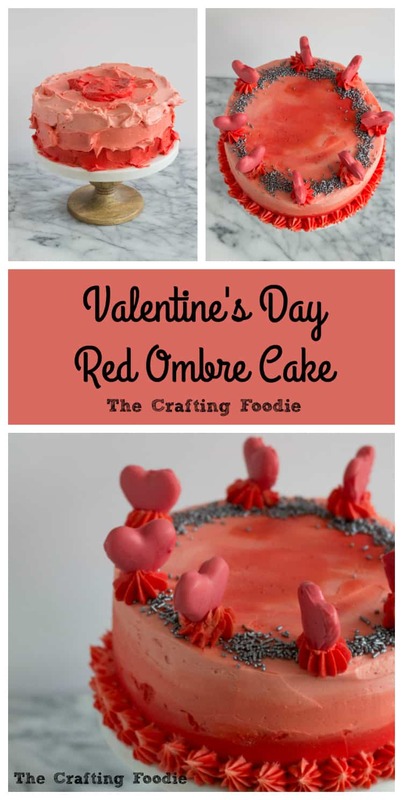 Nothing says Valentine's Day more than this Red Ombre Cake! 2. 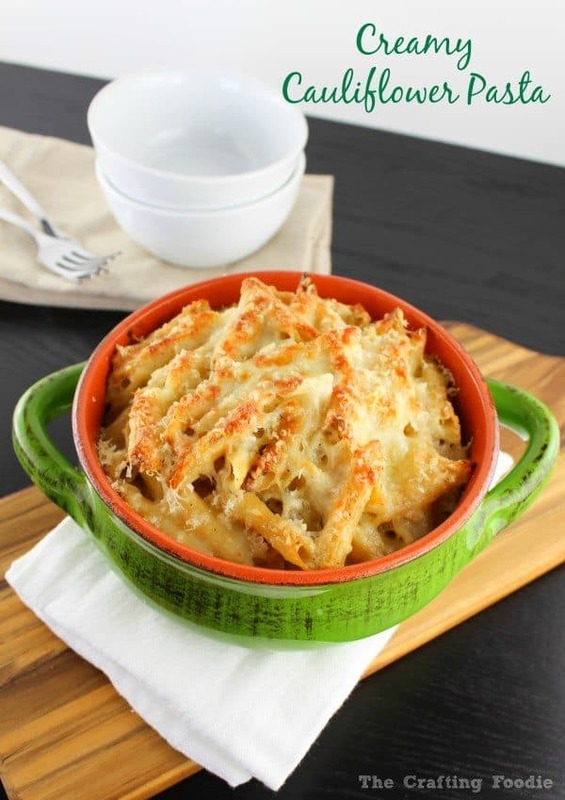 Line 3, 8-inch round cake pans with parchment paper. Grease each pan. 3. In a medium bowl, sift together the flour, baking soda, salt, and cocoa powder. Set aside. 4. In another bowl, mix together the milk, vinegar, vanilla and water. Set aside. 5. In a large bowl, whisk the oil and sugar until the sugar it completely incorporated. 6. Add the food color and mix until combined. 7. Add the eggs, one at a time until just combined. 8. Add the rest of the liquid ingredients (the milk mixture). 9. Add the dry ingredients. Mix until just combined. 10. Divide the batter equally between the three pans. 11. Bake for 30 to 35 min, or until a toothpick inserted in the center of the cake comes out with a few crumbs attached to it. 12. Allow the cakes to cool in the pans for about 15 min. 13. Turn cakes out onto a cooling rack. Allow them to cool completely. 1. Follow the directions in the link above. 2. Once the cookies are completely cooled, melt the confectionery coating. 3. Dip each cookie into the coating, and place on a parchment lined sheet pan. 4. Refrigerate until ready to use. 1. In the bowl of a stand mixer fitted with a paddle attachment, beat the butter until fluffy. 2. Add the sugar. Beat until smooth and fluffy. 3. Add the vanilla, salt, and cream. Beat until just combined. 1. Using a serrated knife, trim each cake so that they are flat. 2. 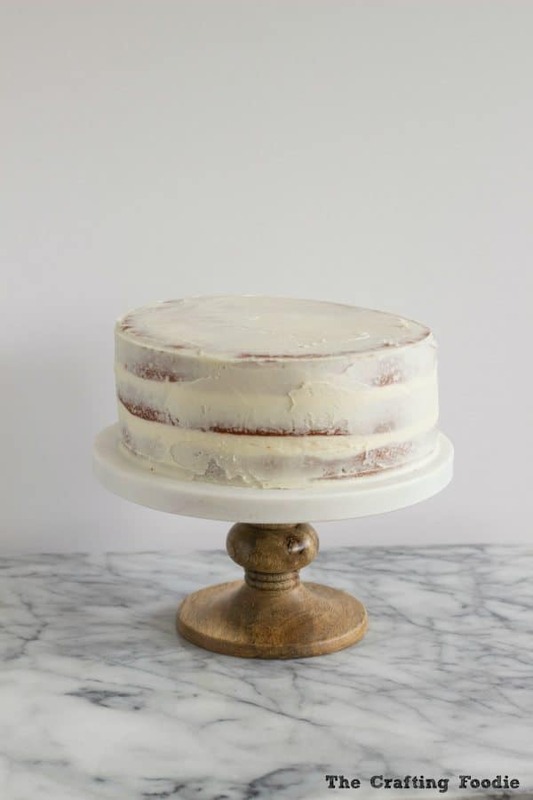 Place the first cake layer on a cake stand. Evenly spread a scant 1/4 cup frosting evenly over the cake. Place another cake layer on top. 3. Continue to stack the cake with the next layer in the same manner. Top with the last cake layer. 4. Refrigerate the cake for about 20 min to chill. 5. Spread a very thin layer of the frosting on the top and sides of the cake. This thin layer of frosting will lock in the crumbs. 6. Return the cake to the refrigerator to cool for about 20 min. 7. While the cake chills, divide the remaining frosting into three equal bowls. 8. In the first bowl, add enough food color to create a vivid, red frosting. 9. In the second bowl, add a little less color, and mix until thoroughly combined. 10. In the last bowl, add the least amount of food color. Mix until thoroughly combined. 11. Take the chilled cake out of the fridge. 12. Using an offsset spatula, spread the darkest color frosting along the bottom of the cake. 13. Cleaning off the offset spatula, spread the next color over the middle of the cake. 14. Once again, with a clean offset spatula, spread the last color frosting over the remaining portion of side of the cake and the top of the cake. 15. Clean off the spatula again, and smooth over the frosting. Each time you lift the spatula, remove the extra frosting on the spatula into a bowl. Reserve the extra frosting. Continue the process until the cake is smooth. 16. Place the extra frosting in your prepared pastry bag. 17. Pipe mounds of frosting along the edge of the cake. 18. Place the prepared cookies into each of the mounds. 19. Sprinkle with Jimmies (sprinkles). 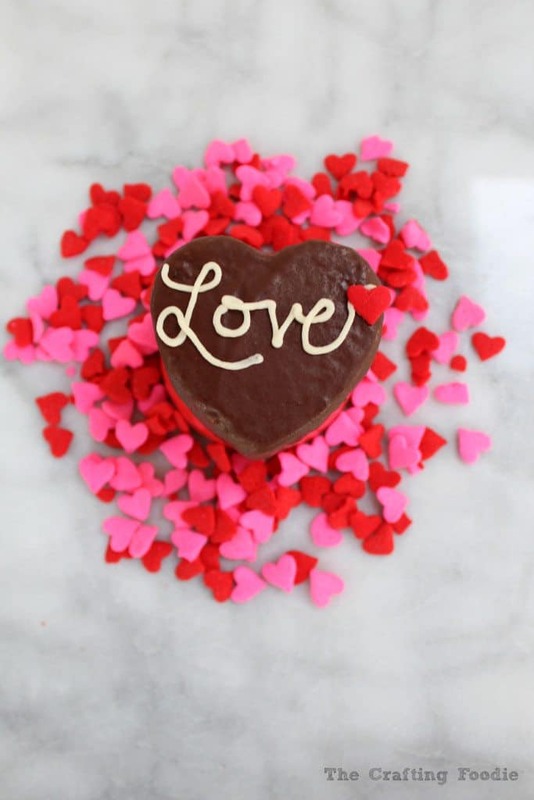 If you’re looking for more decadent sweets or some healthy, easy family meals, check out The Crafting Foodie and following along on Instagram, Pinterest, Facebook, Google+, and Snapchat (@craftingfoodie).